Cold Blue Midnight is the story of Jill Coffey and begins a number of years after the death of her husband, Peter Tappley. He was a rich, handsome guy, Unfortunately he was also a killer. Peter was only 32 when they sent him to the electric chair and, up until the last moment, a lot of people still believed that a stay of execution might be granted. A family as powerful as the Tappleys could pull a lot of strings, could they not? On the day of the execution Peter had the breakfast of his choice: oatmeal, wheat toast with strawberry jam, a large glass of orange juice and two cups of coffee. His mother, Evelyn and his sister Doris, came to see him, as did his ex-wife, Jill Coffey. No stay of execution was issued so at midnight they threw the switch on Peter Tappley. Six years later Jill, a successful photographer, becomes aware that her apartment is being staked out. When you are the ex-wife of a serial killer the media never totally forget about you and Jill believes that the person watching her is probably just another news hound that wants to drag up the past and try to get a story out of it. Why not? It’s happened before. Jill decides to take out an injunction and stop the madness before it begins. Before she can get an injunction though, Jill needs to know who is following her and what newspaper, or TV show, they are working for, so she hires a rather interesting private detective called Marcy Browne. Unfortunately for Jill she is going to have a little more on her plate than an annoying reporter or two. A certain someone still blames Jill for the crimes that her husband committed and Jill is destined to end up in the frame for murder. I read a hardback copy of Cold Blue Midnight and it ran to 282 pages. Although I had heard of Ed Gorman I had never read any of his work. It was the cover that decided me on buying the book. It had a slightly spooky looking house in the background and a very bloody axe in foreground, so I decided to break some new ground and see what the book was like. It’s very good and I read it in just 2 sittings. I tend to prefer reading supernatural horror rather than stories that acquaint the reader with characters who like to cut and chop and do it well enough to become what could be counted as skilled workmanship in any other circumstances. There is nothing supernatural about Cold Blue Midnight, but it does have some super characters in it and there are some nice twists thrown in as well. I liked the character Jill Coffey—a confident and resourceful woman who can hold her own in a man’s world. I also liked Marcy Brown and for much the same reasons. The character I disliked the most had to be Evelyn Tappley: an overbearing mother, a control freak and . . . well—don’t get me started on all of that, we are talking parental love gone haywire. 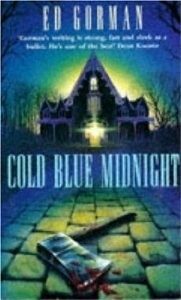 Cold Blue Midnight is a well written book with good, solid characters. If the thought of sharp implements working on flesh, is repugnant to you though, you might need to look elsewhere for some bedtime reading.